The CMCA board continues to meet to plan and organize the main events slated for the Central Region this fall, namely, the Senior and Junior School Choral Workshops, the Central Manitoba Youth Choir, CMYC’s tour itinerary, and the third annual Jazz Workshop. Central Manitoba Choral Association, a group of dedicated volunteers, has successfully presented these choral programs for the past thirty-five years to promote and enhance choral music in the Central Region. A new community young adult choir, Prairie Soundscape, is underway in its second season. under the co-direction of Karen Giesbrecht, choral director at Northlands Parkway Collegiate and Melanie Urichuk, choral director at Garden Valley Collegiate. Having long felt that this was a need in the area, the choir, ages 18-25, was formed to give young adults from the Winkler/Morden region a place to sing after graduation. Prairie Soundscape is dedicated to creating choral experiences that feed the soul, build community and create expressions of joy in personal and collective musical excellence. Their season will run from April through June. A strong media presence has been launched and a PR campaign is being undertaken to build membership. More info coming soon; feel free to contact kgiesbrecht65@gmail.com, and please forward to anyone you think may be interested. Be sure to check out their lively Facebook page! This community based choir, comprised of singers from across southern Manitoba, has been in existence for a number of decades. The choir is presently under the direction of Madeleine Friesen, with Loren Hiebert at the piano. They have a spring and a fall season in which rehearsals are held once a week, with each season ending in two concerts. Details of their upcoming event are found on the poster below. The annual Vocal Jazz Workshop was a rousing success once again, with the expertise of clinicians Stacy Nattress and Alisa Wiebe well received and enjoyed. There were seven groups, with participating singers from St. Claude, Manitou, Morden and Winkler. The concert at the Manitou Opera House was well attended. Organizers for the day were Al and Loretta Thorleifson, and Karen Giesbrecht, president of CMCA. All enthused about the day, and plans for next year are already taking shape. The Central Manitoba Youth Choir is pleased to announce that their 2109 conductor will be Philip Lapatha. Philip is a choral specialist at Maples Collegiate in Winnipeg, together with Dorothy Dyck, last year’s CYMC conductor. He and Dorothy were recent co-winners of the Wpg. Music Festival’s Michael J. Proudfoot Award, presented annually to a conductor exemplifying passion for choral excellence. CMYC’s super-pianist, Loren Hiebert, will return to the piano in his 14th year with this choir! Dates of rehearsal camps and tour venues will be announced in the spring season. 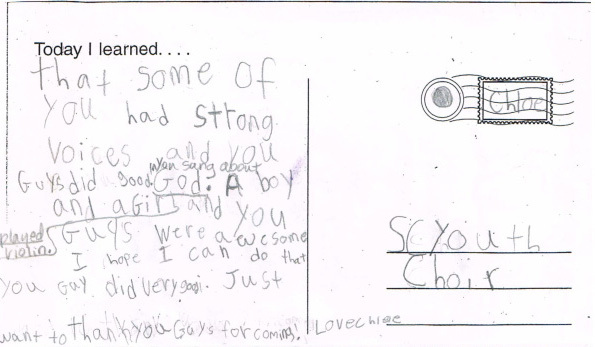 Read more about CMYC and the choir’s singing adventures at http://centralmca.weebly.com. CMYC 2018, open-air performance at the Manitoba Legislature. The Senior Choral Workshop was held in Crystal City on Thursday, October 11. Grade 9/10 Choir: Vic Pankratz, conductor, with Gloria Johnston, pianist. The evening concert, which also featured CMYC 2018, took place at the Cornerstone Church in Crystal City. CMCA board member, Kimberly Harms, provided leadership for this event. The Junior Choral Workshop was held in Austin on Monday, October 15. The concert at 4:00 at the Evangelical Fellowship Church featured these three choirs and CMYC 2018's final performance. Carolyn Farquharson provided leadership for this event. 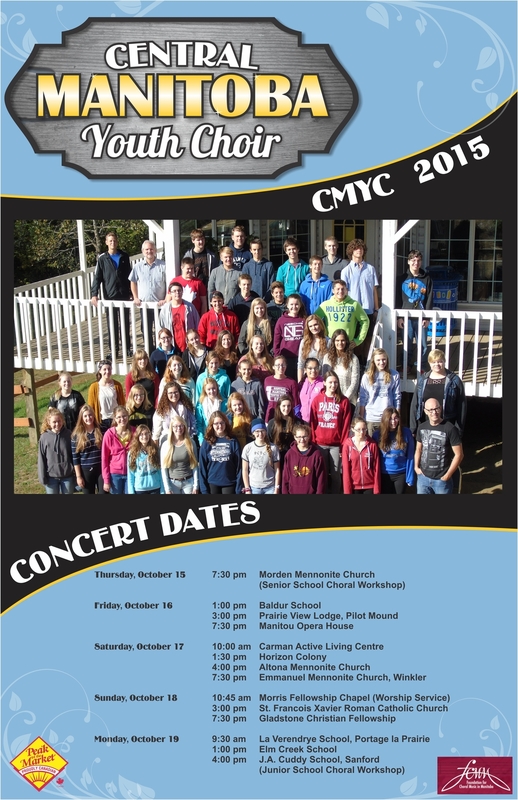 In October of 2013, fifty excited and talented young singers from across the Central Region combined forces with conductor Stuart Sladden and accompanist Loren Hiebert to embark on the 29th tour of the Central Manitoba Youth Choir. 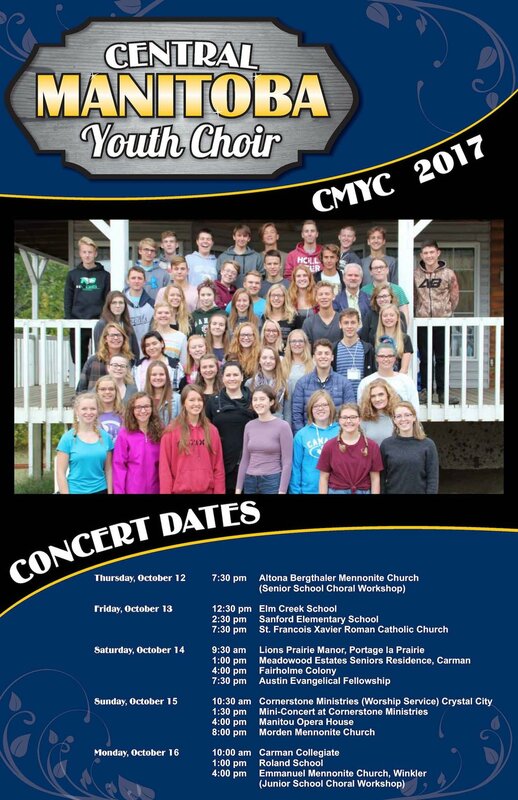 A project of the Central Manitoba Choral Association, CMYC once again provided an opportunity to build a strong community among the young singers of the region, as they shared their music in fourteen communities across the region. The singers prepared for the tour with two intensive weekend rehearsals at Circle Square Ranch, where they sang, ate, sang, rode horses, sang, slept, sang, and had talent nights where they – you guessed it – sang. Sladden connected immediately with the group as they built a powerful and energetic program, while Hiebert, a much loved fixture in the group by now, worked his magic at the piano. Many parent chaperones and committee members chipped in to make these weekends run smoothly. The tour ran from October 17 – 21, and began in Portage la Prairie (Senior School Choral Workshop), continuing to Gladstone, and Elm River Hutterite Colony, where the group was treated to a tour of the community. They continued on for a much celebrated return to the Manitou Opera House, Pilot Mound, and Pembina Valley Provincial Park, where a highlight was singing around the outdoor Stone Circle at the Arocha site. Then it was on to Carman, Morden, Elm Creek, Winkler and Altona. The final day featured performances in Morris, where the choir had not performed for many years, Elie, and finally St. Francois Xavier (Junior School Workshop), where they departed amidst a flurry of tears, smiles, hugs, and promises to meet again. Tour manager Al Thorleifson and Chaperone Cynthia Mayo kept the tour machine running smoothly, fueled by the wonderful music and delicious meals served by communities along the way. Many people opened up their homes to billet the singers for night, providing the singers and staff with bag lunches, and following the choir around to take in multiple performances. The Central Manitoba Choral Association would like to thank everyone who helped to make this tour a success, including parents, teachers, committee members, billeters, audience members, and our many generous donors. The Central Manitoba Choral Association is proud of the Central Manitoba Youth Choir – they are representative of our region’s choral future, and judging by this year, it is in good hands! 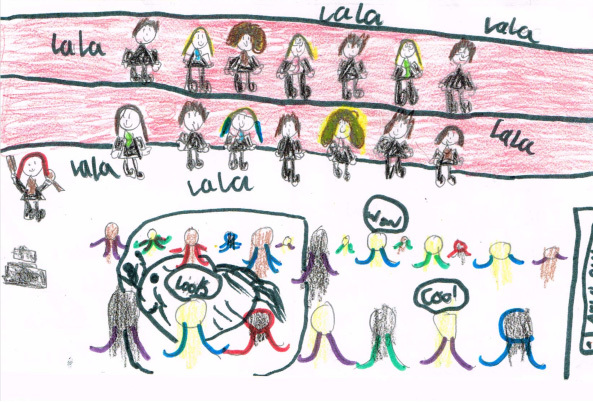 Postcards created by Morris School students after seeing the choir.